The Children’s Feeding Trust this year, celebrates 60 years of helping alleviate hunger in South Africa by providing nutritious meals to vulnerable school children in Port Elizabeth. The Children’s Feeding Trust is a Non-Profit Organisation that was established in 1958 to address the problem of hungry children at schools. After the South African government took over the school feeding programmes post 1994 elections, the organisation felt a need to focus on pre-school children who, through physical and mental disability could not attend school. 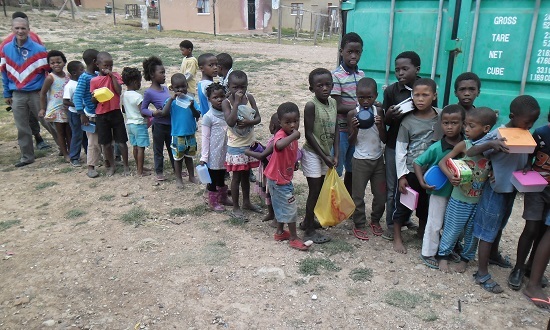 The organisation supports and monitors a variety of charities who conduct feeding schemes for children in the region. The trust runs year-round fundraising campaigns to raise money and food donations. It also runs a charity book shop at the Walmer Community Library where the public are invited to purchase and help donate to a worthy cause. Over 7,000 children are fed daily by the organisation. They receive a nutritious meal which helps them focus on learning for the school day. The Children’s Feeding Trust’s future plans are to be able to continue to expand their footprint in the Nelson Mandela Bay region, focussing on children. Last year, FoodForward SA provided 17.6 million meals across the country through its network of 600 Beneficiary Organisations, at a cost of only R0,79 per meal. This is achieved because of its partnership with all the major wholesalers, retailers, and manufacturers, as well as farmers, who donate quality, within date, edible surplus food. FoodForwardSA is doing a great job – may they continue to grow and go from strength to strength. The Children’s Feeding Trust’s bookshop, which is a great source of income and is currently having a sale – all books selling for R5 each until Saturday, 8th September, is located in the Walmer Town Hall and not the community library.